We are off and running to begin to measure our impact based on our goal of reducing waste by 10% in 2013. We are tuning up our heating systems now as we’ve entered the winter season and fine tuning our domestic hot water systems as well. We complete this process annually even though most do it every other year to make sure we stay as efficient as possible. On the heat topic, roughly 1/3 of our communities have baseboard heating, here’s a great diagram created by our Woodstone team that references the importance of properly understanding how the system works for the highest efficiency. 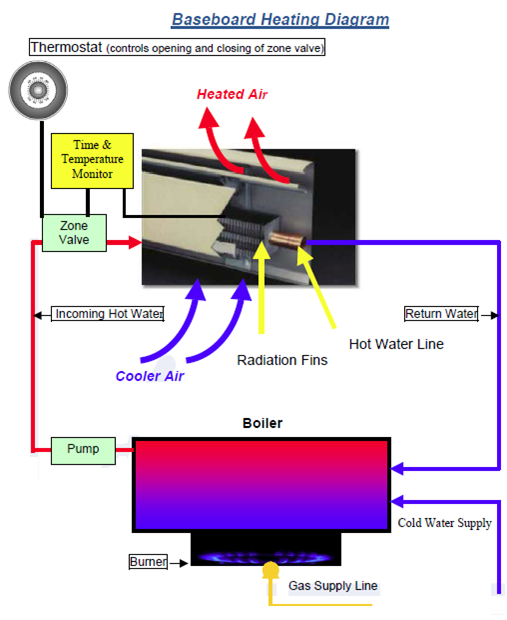 Please refer to the diagram below which illustrates a typical hydronic baseboard heating system. As the diagram shows, water is heated in a boiler to 160-200 degrees. The boiler fuel source is gas. A circulating pump distributes heated water throughout the building. Copper water lines are used to carry the heated water from the boiler to the baseboards. Each apartment has an individual thermostat. When the air temperature in the apartment drops below the thermostat setting the zone valve is activated allowing heated water to circulate through the water lines to heat the emitters; like the radiation fins depicted in the illustration. As cooler room air passes over the radiation fins, the air absorbs heat from the fins and distributes the heated air by natural convection. When the room air temperature reaches the desired setting, the thermostat closes the zone valve. The colder return water is then delivered back to the boiler and reheated. This cycle repeats as the room temperature fluctuates. *If the air temperature outside does not drop below 52 degrees the heating system will not engage. Please consider repositioning furniture, draperies and other obstructions away from the front of the baseboards. By removing these obstructions from the baseboards you can maximize the heating efficiency. Set your thermostat between 68-72 degrees during the winter months. During the winter months keep your shades and blinds open during the day to allow sunlight and heat into your home. At night close the shades and blinds to slow heat loss through the glass windows. It may be necessary to seal your windows with plastic in order to keep out any cold air drafts. If it is cold in your apartment please make sure the louvers (vent flap) is open and vice versa if your apartment is too warm. We hope you found this tip helpful! Let us know, how do you strive to reduce waste in your home? I would suggest that residents be informed of how to recycle special items such as batteries, light bulbs, and electronic items. Hi Bill! Thanks for your comment. Great suggestion! We will definitely plan that to communicate that information in a future blog post. What CAN still be put down the trash shoot? Where will the recycling bins be? Hi Mary! Thanks for your comment. Recycling bins are usually located in the garage level trash rooms. Each community is different, if you could please reach out to your on-site team they will be able to give you thorough descriptions of what you’re allowed to place down the trash chute. Thanks again! I would recommend making people aware of renewable energy programs and energy efficiency programs. For example, I get my power through Xcel Energy, and they have a program called Windsource, where you can designate a certain percentage of your power to come from wind. I’ve designated 100% of my power to come from wind, which adds only about $10 to my monthly electric bill–a small price to pay for getting all of my power from clean sources! !